ERS Marine are the UK/EU Stockists and Distributors for the SynDeck Marine range of Fully Waterproof Fast Curing Wet Space and Shower Tray Systems. 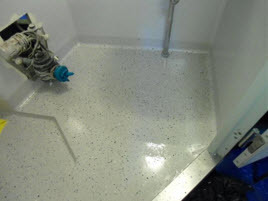 A range of waterproof fast curing wet space and shower tray systems that can be installed whilst the ship is at sea or in dry dock. These systems benefit from excellent chemical and moisture resistance. Decorative flake and matt seal options are avaliable. We can also provide slip resistant options. Our UV curable solution uses the latest in UV technology, curing the coating almost instantly. Our range of systems are suitable for shower deck/ tray areas and wet spaces. Find our Shower Deck Repair Case Study here.